Toshiba’s VFAS3-2185P adjustable speed drive is designed with an emphasis on built-in communications, allowing end-users to access real-time data and refined controls to maximize system performance. • Industry 4.0/IoT (Internet of Things) – Industry 4.0 is the evolution of manufacturing, empowering businesses to learn and adjust from data available through connected manufacturing. • Dual Port Ethernet IP – Enables simple connection of multiple AS3s together on one network while simplifying cable management. • Embedded Web Server – Allows for quick access to Ethernet IP setup, parameters and real-time monitoring for diagnostics. Accessible through standard web browsers on PC, tablets, and smart phones. • Built-in LCD Display & Advanced Keypad – Multi-language LCD display, remote mounting, available IP65 cover, transfer/save parameters, real-time clock for fault logging, and calendar functionality. • QR Codes – Displayed when troubleshooting faults or alarms, providing immediate access to a dedicated web link for maintenance and support. • STO Terminal – Detachable terminal strip meets IEC directives for safety with full implementation of Safe-Torque Off, which quickly shuts down the system in the event of an emergency stop. • Permanent Magnet Motor Control – For control of permanent magnet (PM) motors with higher torque and efficiency values. • Pump Control – Multi-PID control with sleep function and the ability to autonomously control booster pumps based on system demands or operating a secondary PID control loop. 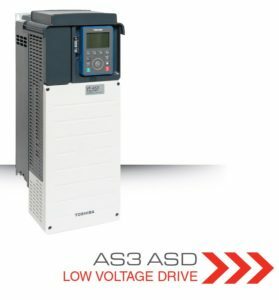 • ASD Pro Software – Toshiba’s programming software, which allows the user to utilize logic-type programming without the expense of a micro PLC.